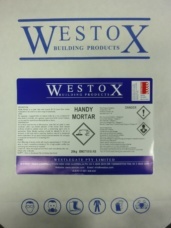 Handy Mortar is a 6 sand, 1 lime and 1 cement (6:1:1) based fine mortar formulated to be used on a wide range of substrates. Each 20kg bag of handy mortar will require approximately 4 – 5 Litres of water to reach a spreadable consistency. For a high profile a stiffer mix containing less water may be required. Do not apply during inclement weather. Do not apply in temperatures below 5ºc or exceeding 30ºc.